This film received an honorable mention on the Best of 1998 list. It's going to be hard to replicate on any size TV the overwhelming and disorienting sensation one gets in the theater watching the 30-minute recreation of the Normandy invasion that opens this picture, and without that sensation, never before equaled on film, the impact of this movie will be severely diminished. The soliders stories that make up the middle act will play just adequately, but you just can't feel like you're in the middle of a war in sitting comfortably in your living room easy chair. Best advise: If you don't have a home theater system with DVD, surround sound and at least a 50" TV, find someone who does before you rent "Ryan." "Saving Private Ryan" beings with 30 minutes of loud, disorienting, bloody, gruesomely authentic combat footage, the likes of which have never been fictionalized on film before. This is a World War II movie and by agonizingly inching up the beach in the Normandy invasion with hundreds of soldiers, many of them dying shocking, grizzly deaths, director Steven Spielberg wants everyone in the audience to understand what war means. It means watching a friend screaming in agony for his mother as he gushes blood from limbs scattered all over the sand by a mine. It means killing young strangers, sometimes face-to-face. And it means, if you survive, never being the same man again. "Saving Private Ryan" is largely the story of an Army unit sent behind German lines to retrieve a soldier whose three brothers were all killed in combat, so his mother will not have to grieve all four of them. It's a moving allegory about duty and honor, doubt and faith, patriotism, mettle and courage, with layered characters you become intimately involved with after surviving D-Day with them. But it is the battle scenes, which burn in your mind for days afterwards, that distinguish this film. Without them it would be just another Spielbergian heart-stringer with a heavy dose of flag-waving. Bookended by manipulative, hankie-wringing moments with a 70-something Pvt. Ryan visiting the graves of his saviors at Normandy Beach cemetery, the core of the film begins with American transports hitting Omaha Beach on June 6, 1944 and being mercilessly pounded by deeply entrenched German resistance. Tom Hanks plays a captain leading his unit -- including Tom Sizemore, Edward Burns, Barry Pepper, Adam Goldberg, Vin Diesel and Giovanni Ribisi -- in the early part of the assault, which is realistic in a way many moviegoers might not be able to take. This scene makes this audacious invasion a visceral experience. With mostly subjective camera shots, Spielberg pulls no punches, thrusting us into the middle of the desperation and panic, the smoke, the ceaseless machine gun fire and artillery bombardment. The beach is littered with bodies. The surf is blood. The camera lens is splattered as the man next to you is shot. Shouted orders are largely lost in the din of exploding shells and the screams of wounded soldiers. You suddenly comprehend the thankless, almost pointless job of the battlefield medic. You are there in the pit of your stomach and with your heart in your throat. It took the better part of a day to establish a beachhead in this historic battle, and by the time we see Hanks receiving his unit's new orders at his commander's tent, his troops are exhausted almost beyond recognition. Meanwhile, on a farm in the heartland of the United States, a scene almost as painfully drawn takes place. A mother with four sons in the war receives three telegrams at once announcing the deaths of all but one of them, and a Colonel in the War Department decides to see to it her last child comes home safe. Hanks and his unit get the assignment, but many of them would rather be in direct combat with the Nazis and question the value of searching the French countryside for a single man. A very good marriage of idealistic and heroic 1940s war movies and the realism of later Vietnam dramas, "Saving Private Ryan" is groundbreaking while being, for better or worse, every inch a Steven Spielberg movie. When not directly immersed in the business of war -- although every moment is ripe with the possibility of attack -- the characters in the unit searching for Ryan unfold in guarded conversations and personal affectations. The expert marksman and sniper (Pepper) says a prayer with ever round he fires. Re-assigned from near-desk duty, the group's maladroit, scared and very green translator (Jeremy Davies) becomes the conscience of the unit despite being the odd man out. Spending the night in a bombed out church, Hanks laments matter-of-factly to Sizemore about how many men have died under his command, while his right hand tics nervously. (Later he has a scene where he fights off the Big Cry). Another soldier re-copies a dead friend's letter to his parents onto clean military stationery so they will never see the original soaked in blood. They all look acutely weary. Some will break down before long, another will threaten to go AWOL, and throughout night bombing can be heard in the distance. Spielberg shot this film in muted gray tones, as if the mud of the battlefield covered the men and the mood. The impressive cinematography, by Janusz Kaminski ("Schindler's List," "Amistad," "Jerry Maguire"), varies from beautifully silhouetted shots of soldiers marching across the horizon while bombs flash in the distance to grainy combat footage shot at a slower camera speed to amplify to the lurching effect of the handheld camera. All the performances are deftly in harmony with the period flavor of the film and with each other. Acting as a unit, there are no standouts in the central cast, but every actor is deeply submurged in his role. The incredibly detailed production design, however, does stand out. 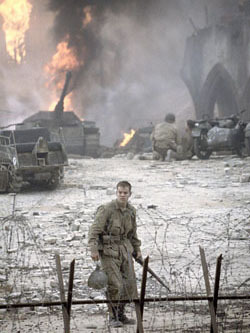 After finding Ryan (Matt Damon), who refuses to abandon his post, our heroes join his unit's defense of a bombed-ravaged village, which leads to another 10 to 15 minute, sense-pounding battle scene that takes on a more rally-around-the-flag air than the Normandy scene. The acres of sets that make up this village are nothing short of astounding. I can't imagine how the filmmakers created this location short of actually building a town and bombing it. "Saving Private Ryan" may go down as the war movie to end all war movies. There have been several better films this summer, but none more disturbing or authentic.